The crash was tremendous. It sounded like the china cabinet had fallen over. Then I remembered that we don’t have a china cabinet. I was sitting behind my desk in the den talking to my daughter when it happened. First I heard a dragging sound. Then came the crash, followed by my son’s screeching. I jumped up and followed the sound of his cries, my daughter trailed close behind. When I turned the corner of the kitchen, I found my son sprawled out on what appeared to be a bed of ice. But it wasn’t ice. 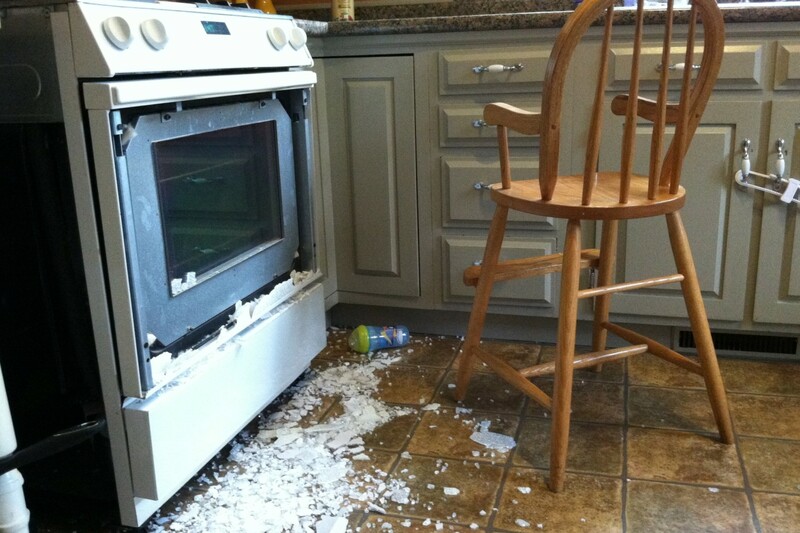 It was shattered glass from the door of the oven. I immediately scooped up my little guy and dusted off the little flecks of glass that covered his arms, checking for any cuts. Luckily he was fine; he was more scared than anything. Once I determined he was OK, I began to piece together the clues of the crime scene using the detective skills I acquired at a young age from reading Hardy Boys mysteries. From what I could surmise, The Animal spied a sippy cup on the kitchen counter. He then went to the dining room to retrieve his sister’s high chair, which he dragged into the kitchen and climbed on top of before attempting to grab the cup. But as he reached out for his prize, the chair must have slipped out from underneath him, sending him falling toward the floor. On the way down, his head or possibly the sippy cup made contact with the oven door, shattering the outer layer of glass. That certainly cleared things up. He seemed pretty shaken up about the whole thing, so I asked him once more if he was OK.
Well, at least he was speaking clearly, which ruled out a concussion. I’m not sure if I’ll ever get used to having a boy. The kid’s been around for over two years now and I’m still not accustomed to his adventurous nature. Boogieface never attempted anything like this. We didn’t even have to gate the stairs for her; she just wasn’t interested. My son, on the other hand, is constantly building makeshift ladders in order to reach things we try to put out of his reach. And if we forget to secure the gate at the bottom of the staircase, he immediately senses it and makes a mad dash up the steps, where he can then raid his sister’s bedroom or make for the bathroom and clean his teeth with the toilet brush. 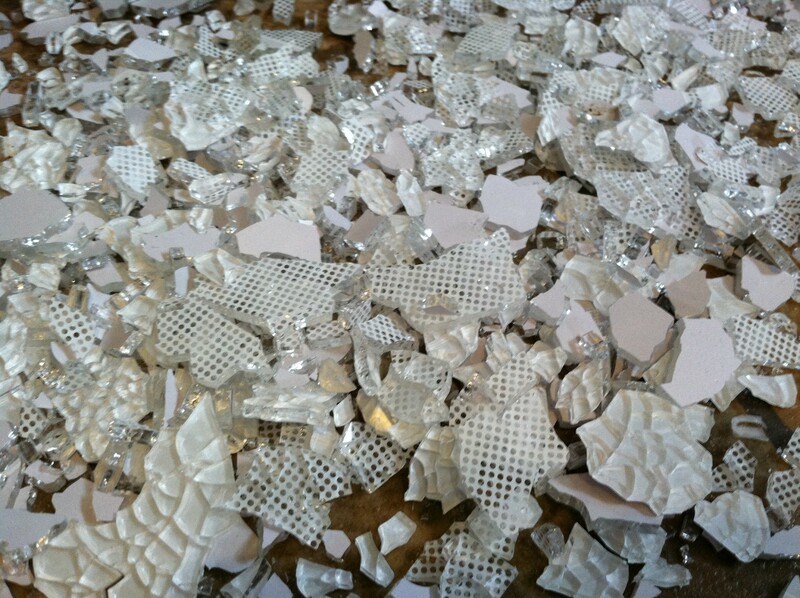 For the next half hour or so, my wife and I scoured the floor for the tiny shards of glass that were scattered throughout the kitchen. Meanwhile, my daughter stood in the doorway and worked as a spotter. “There’s another piece of ice!” she said, still not grasping what had just happened. Once we got all the “ice” cleaned up, I called the local appliance store to see just how much this little sippy cup fiasco was going to cost us. 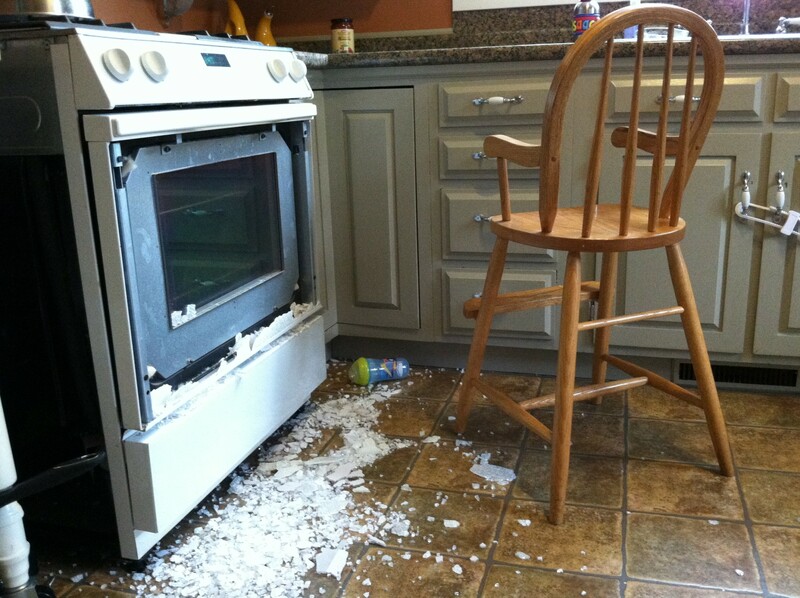 It turns out our oven is so old that it might cost as much to replace the glass as it would to buy a brand new oven. Splendid. But of course, boys will be boys, and accidents happen. The important thing is that my son wasn’t seriously injured. As for the oven, I’m not really worried about the money. We’ll just take it out of my son’s college savings. 6 Responses to "The Animal Strikes Again!" Glad no one was hurt. Enjoy the stove-shopping. I hate the stove that came with our new house, so your son has given me an idea…..
I’m impressed that you had the wherewithal to document the event with photographs. Well done! And I don’t know if it ever occurred to you, but with the oven being so old, are you sure your wife didn’t put The Animal up to to it so that she could get a new stove? Just saying….. I too was once an “Animal” when I was a little kid. (My husband might argue with this but we won’t go there.) My prey was my mother’s china cabinet. It had real, antique china from China worth big bucks. The cabinet and I survived but the China did not.